How the olfactory system encodes odor concentration is a comparatively underexplored and largely unresolved question. We have constructed a model of the early olfactory system which is capable of a fuzzy signaling of concentration, through glomerular competition resulting in inhibition of most mitral cells. Each mitral cell responds optimally to a narrow odor concentration range. Our model consists of three separate subsystems: an olfactory receptor neuron array, a glomerulus module with inhibitory competition between mitral cells, and a bulb model with mitral and granule cells. The bulb model is implemented in the neural simulator NEURON and its two cell types are both Hodgkin-Huxley type multicompartmental models adapted after Davison et al , whose original model is freely accessible through the ModelDB database . We simulate 25 mitral and 100 granule cells. ORNs are arranged into groups with increasing response thresholds, each group connected to one mitral cell. Competitive inhibition makes each mitral cell respond most in a specific odor concentration interval. The competitive glomerular dynamic (see Figs. 1 and 2) is at present modeled separately in MATLAB, and input is given to the NEURON model as a voltage clamp of the mitral cells glomerular compartments. Our model represents one glomerulus. In order to model olfactory bulb activation patterns, we can copy the single module multiple times and add interglomerular connections, so that we get a setup with a suitable number of glomeruli with different inputs. 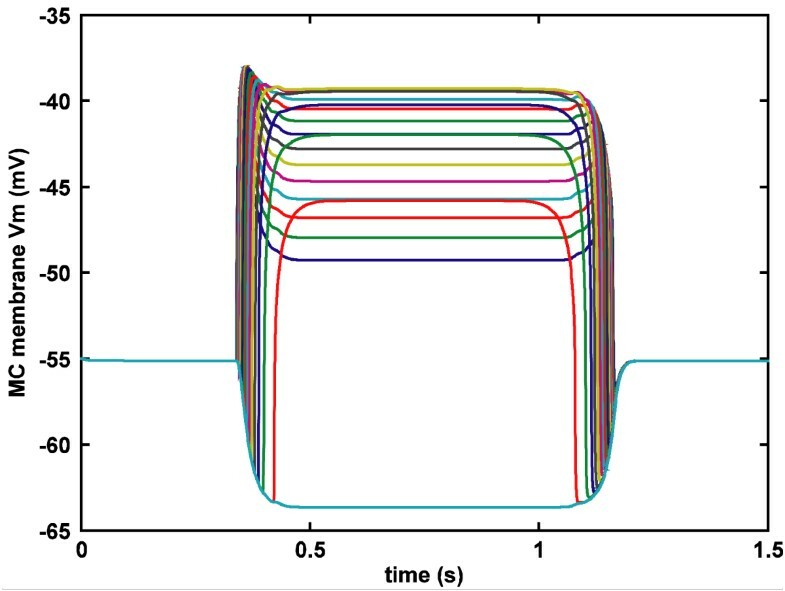 MC glomerulus voltages over time. MC glomerulus voltages at t = 0.75 s. Star indicates most responding MC. We show that it is possible to achieve a fuzzy interval code for concentration in a glomerulus, with only a few mitral cells active (Fig. 3). 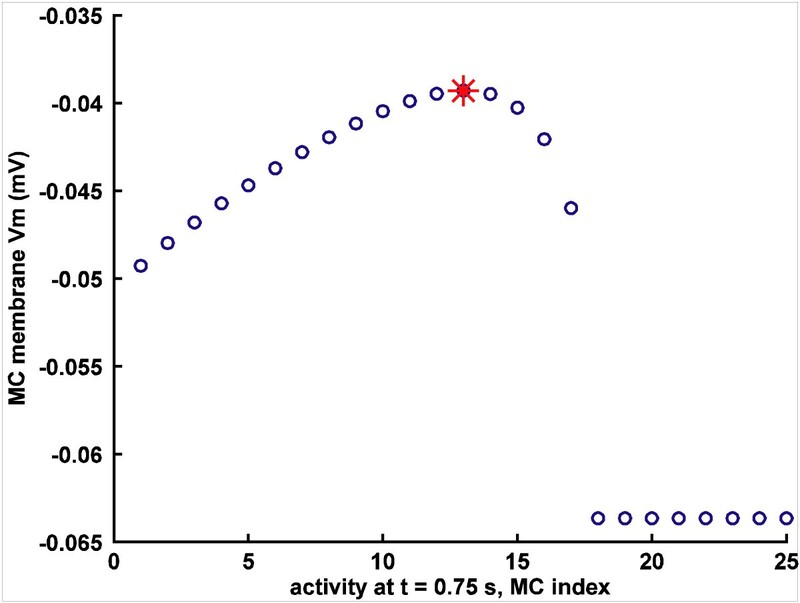 The cells that are active correspond to the cells most closely matched to the input concentration, here MC #13 and its immediate neighbors MC #11, 12 and 14, and active cells spike in a synchronized manner. The identity of the spiking cells thus approximately indicates the concentration. This behavior holds for a range of random connectivities from 100% to 25%, with and without noisy connection weights for AMPA, NMDA and GABA. A code like this would also have metabolic benefits in an odor-dense environment, since the energy consumption would be diminished compared with a case where many cells spike at high concentrations. 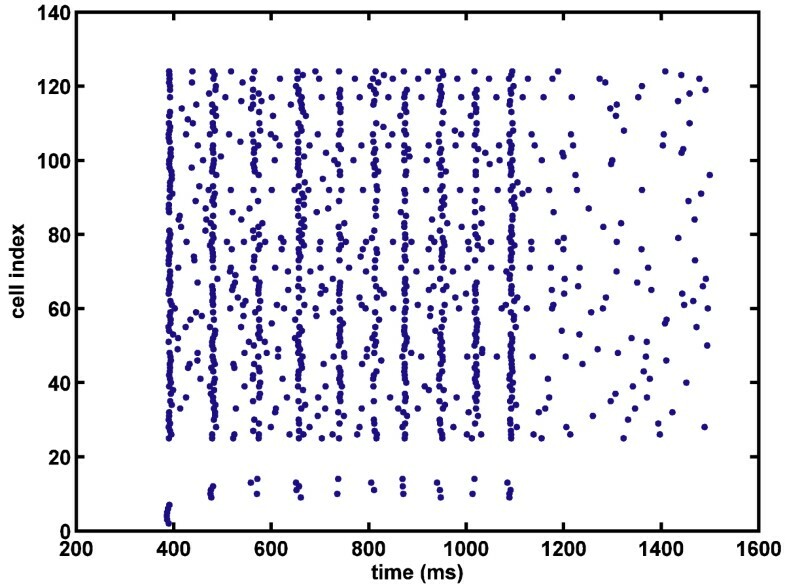 Spike raster plot. Mitral cells #11-14 spike synchronously, the rest are silenced. The identity of the spiking cells thus approximately indicates odor input concentration. This work was supported by the European Network of Excellence GOSPEL (General Olfaction and Sensing Projects on a European Level).